If the baby bird has feathers and is hopping on the ground, this is normal behavior. The parents are still feeding it. Leave the baby bird alone. Its parents are far better at teaching it survival skills than we are. 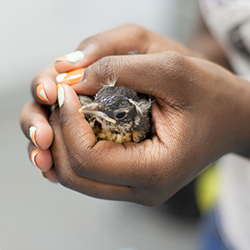 If your child brings home a healthy fledgling, return it as quickly as possible to the place it was found. Then step back thirty feet or so and wait for up to 45 minutes to see if an adult bird flies down to feed the youngster. It can be quite a battle to get the “rescuer” to bring the young bird back to its parents, but when accomplished, the reunion can be a joy to watch. 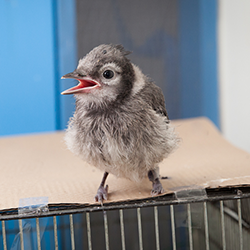 If the baby bird does not have feathers, it is a nestling and needs to be returned to its nest. A baby’s best chance for survival is its mother. If the nest is intact, put the baby back in and observe from a distance to ensure the parents are visiting the nest. If the nest has been damaged, make a substitute by poking holes in the bottom of a berry basket/margarine tub; line with dry grass, the old nest, or pine needles; hang from original or nearby tree. Observe from a distance to ensure the parents are visiting the nest. 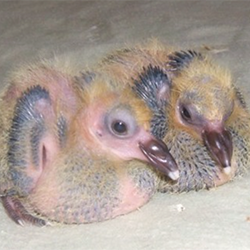 It is a myth that a bird will reject a baby because it was handled by humans. Don’t Bird-nap! If the baby bird is unable to flutter wings; bleeding, wings drooping unevenly; weak or shivering; attacked by cat/dog, gently pick up the baby and put it in a paper bag or small box with holes in it. If the baby is shivering, wrap a warm water bottle in a towel and place it next to the baby. Do not give the baby food or water. Do not bother or handle it. Keep children away. 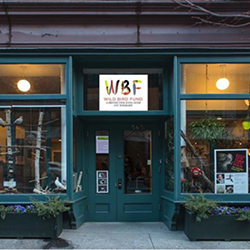 Call us at 646-306-2862 or email us to make an appointment. Note exactly where you found the bird. The pigeon is a symbol of peace for a reason. There is nothing the pigeon can do to hurt you. Lice and mites on birds are species-specific. This means they only live on birds, not humans. Keep the bird away from your body and wash your hands afterward. 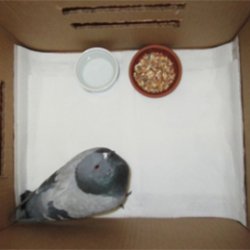 Have ready a small box or a pet carrier to put the bird in once it has been rescued. 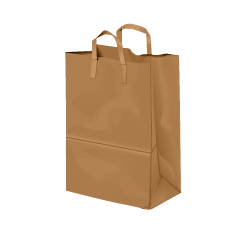 You can also use a large paper bag, but put something strong on the bottom like sheets of newspaper or a piece of cardboard. Make small holes for air. Have another person to help you if possible. One of you can corner the bird or distract it while the other can try to catch it from behind. Make sure there is nobody or nothing nearby that might interfere with the rescue, then quietly approach the bird from behind. The best way to pick up the bird is to use your bare hands. Restrain its wings by holding the bird firmly between your hands. Then quickly put it in the box/carrier/paper bag. 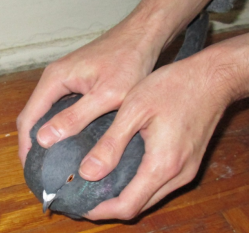 If you are not comfortable handling the bird with your bare hands, you can use light thin gloves, but avoid heavy ones or mittens that will make the capture more awkward and much more likely to be unsuccessful. Remember, you might only have one chance to catch the bird. 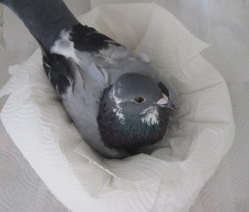 Throwing a heavy towel (preferably a dark-colored one) over the bird is also an option, especially for an injured bird that can fly or walk fast. A pet carrier is the best for temporarily housing the bird. 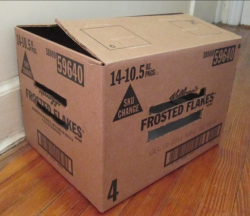 But if you don’t have one, find a cardboard box (12” x 12” x 12” or slightly bigger) and cut rectangular holes on the sides. Make sure enough light gets into the box so that the bird can see water and seeds. Spread sheets of newspaper on the bottom of the housing and then cover the newspaper with paper towel. If the bird has a injured leg or foot, it is good for the bird to have support to its body. Make a doughnut shape with a rolled up dish towel, cover it with paper towel and put the bird inside the doughnut so the injured leg can hang free. Keep the bird in a warm, quiet place, away from children and pets. 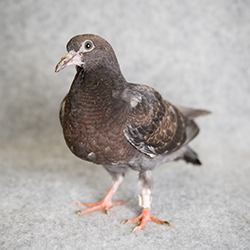 Pigeons sip up water using their beak like a straw, so the water needs to be about an inch deep. Feed bird seeds. You will find it in most supermarkets and pet stores. If not, barley or any small grain will do. Defrosted corns and peas are also good. Please don’t give bread. Good hygiene is important. Change the water and seeds if they become dirty. Quickly cup your hands around the bird. To prevent escape, use your free hand to close the top of the bag around your wrist as your withdraw your hand from the bag. Fold over the top of the bag once or twice and clip it shut with a clothespin or binder clip. Put the bag in a dark, quiet spot, and let the bird rest for an hour. Do not open the bag – the bird could escape and hurt itself again. After an hour, carefully peek into the bag or listen for signs of activity. If the bird if alert, it can be safely released. 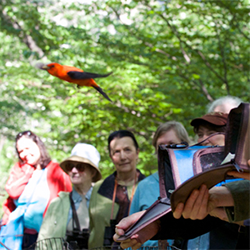 Robert F. Wagner Park, south of the Museum of Jewish Heritage, is a good spot to release birds. Central Park, Battery Park, Prospect Park, and Inwood Park are also good. 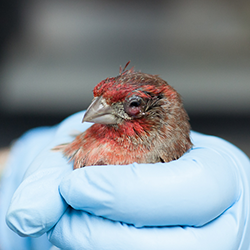 If the bird has not recovered, or appears to be injured, call us at 646-306-2862 or email us.